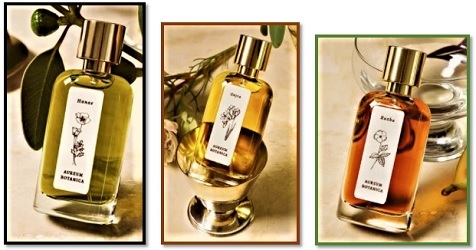 Los Angeles-based Aureum Botanica's three new Eaux de Parfum are "composed entirely of natural ingredients and are free of synthetic aroma chemicals." My nose tells me this is true, but I'm a man, not a machine! Aureum Botanica is part of Capsule Parfumerie, a multi-brand fragrance house that includes Capsule Parfums, Fiele Fragrances (I have several favorites from this line), Saguara Perfumes, Musc et Madame and Litoralle Aromatica. Rich and smoky, Ruzha is inspired by the story of a free spirit, a nomadic woman who drifts from town to town, unfettered by the rules of society. Lush Bulgarian rose blooms in all its beauty. Tobacco smolders. Ancient resins evoke nights by a campfire, while juicy notes of blood orange, strawberry and hibiscus burst forth in a flurry of sweetness. Spicy pink pepper and a hint of cinnamon meet earthy patchouli to create a deep finish that is at once delicious and primal. Ruzha opens with cloves, ripe strawberries and smoky patchouli, with a touch of muskiness — tobacco? On my skin, rose is not apparent, so those who may be tempted by that note should buy a sample first. (I can do without rose in Ruzha.) The perfume ends with the aromas of "nomad teatime": cooked fruit in warm syrup (a combo of strawberry and plum scents), strong, amber-colored hibiscus tea and musty, pungent wood (the tea tray, OK?) To me, Ruzha is a cool-weather/casual perfume, perfect to wear while gardening or on a winter hike in the forest. Sweet and spicy, Gajra is named for the traditional Indian flower garland that brides use to decorate their hair. Exotic floral notes of white frangipani, creamy tuberose, and fresh jasmine petals create a velvety heart, while tropical pineapple and coconut lend sweetness. Resinous frankincense, sandalwood and turmeric ground the scent with the spice of an ancient land and its sacred traditions. Delicate and juicy, Hanae is an homage to the mystery and magic of the Japanese mountains. Chamomile, rose de mai, and geranium enclose a fruity center of apricot and fresh squeezed yuzu. A hint of juniper conjures the freshness of alpine air while grounded green tea evokes a hint of moist earth. Heady notes of incense warm the fragrance and transform it into an aromatic meditation. Hanae is a tart and tangy medicinal fragrance that reminds me of the sharp scent of fresh twigs stripped of their bark. And don't be shocked when I say there's also a scent in Hanae that reminds me of the aroma of clean dog fur (on a LIVING dog I might add); this smell is comforting to me. As Hanae develops, I get whiffs of rose, geranium leaf and the biting sweat scent of juniper leaf. The extreme dry down smells of warm balm sprinkled with incense ashes. Aureum Botanica's line-up is unique in character and all the fragrances wear like all-natural Eaux de Toilette; you'll definitely have to reapply once or twice during the course of a day, especially to experience the perfumes' exuberant opening notes. Aureum Botanica Ruzha, Gajra and Hanae are $175 for 50 ml Eau de Parfum. Q: Exactly how do they source natural pineapple and strawberry essential oil? :/ Do they have a magical garden at their disposal? Ugh. I hate when companies do this sort of thing…but I suppose it you’re going to lie to the public, go big and do it with a straight face, eh? To be fair, I don’t think they’re necessarily claiming pineapple and strawberry essential oils. It is sometimes possible to create accords with natural ingredients. Or they could be using natural isolates, which really isn’t any different from using synthetic molecules, except that the molecules are isolated from natural sources (like vanillin from wood pulp, for example) rather than created from other chemicals. I’m no chemist, that’s for sure but can say the pineapple note is great; the strawberry is dark, gourmand in character. I thought the same exact thing but then figured that they were probably using fruit isolates (I have used them myself and have to say that they smell chemically and off putting despite their claim to being natural)…although you can create a pineapple note with tangerine essential oil and rhododendrum leaf e.o….I have tried it …it works…. You say that, in Hannae, you detected the note of the fur of a clean, LIVING dog. The emphasis that smell is that of a still vital dog is yours. Kevin, have you been going around sniffing dirty dead dogs? Dilana, I sniff everything! Ha! I should have written the fur was still attached to a happy dog…not like sniffing the contents of a dog brush. I love the clean fur smell of my dogs, it is indeed comforting. Never heard of these brands before.